Apios priceana, commonly known as Price’s potato-bean, is a perennial species native to the Southeastern US. Habitat destruction has caused A. priceana to become rare, and it is federally listed as threatened. 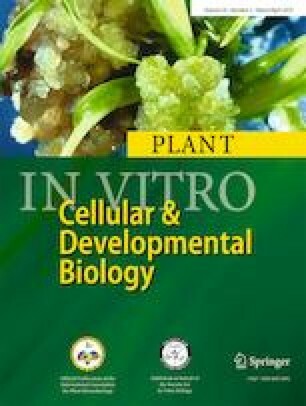 Protocols developed for in vitro germination, shoot micropropagation, in vitro rooting, shoot establishment in soil, and seed cryopreservation will assist in the safeguarding and conservation of dwindling natural populations. Seeds were germinated in vitro on plant growth regulator (PGR)-free Murashige and Skoog (MS) medium after seed sterilization in H2O2 and seed nicking. Greatest shoot multiplication occurred on MS medium with BAP/IBA/GA3 at 2.22/0.49/1.44 μM with 2.0 g/l Phytagel and pH adjusted to 5.7. Shoots rooted in vitro in MS medium with 3.2 μM IBA. Shoots rooted in vitro rapidly established in greenhouse potting mix, usually showing new growth within 2 wk, with tuber formation by the end of the growing season. Plants transferred to a forest setting in late winter survived, grew throughout the summer, and became dormant in the fall. In small post cryopreservation tests with A. americana and A. priceana seeds, air or desiccant-dried to water contents below 10% but above 2.5%, germination reached 87–90%. We thank J. Walter Bland from Rock Spring Farm for collection of A. americana seed and Nathan Paris for collection of A. priceana as part of research for a M.S. degree with Dr. Robert Boyd at Auburn University, AL. We gratefully acknowledge the help of Kylie Bucalo, Veronica Kuntz, and Neha Zaer. We thank the Georgia Institute of Technology School of Biology and Georgia Institute of Technology for providing materials, supplies, and a travel grant for undergraduate research in support of this project. Seed was obtained under US Fish and Wildlife Service permit #TE14229A-0.